The patented ZENA® mobile welding system is designed and manufactured in the USA by ZENA, Incorporated. OEM and/or retrofittable commercial-duty, engine-driven, 100% duty cycle, multi-process, DC arc welders in the world! And, thanks to fingertip remote controls that let you adjust power even WHILE you're welding, you'll enjoy far more control of the welding process than you've ever had with any other welder! A ZENA® mobile DC welder can be attached to the engine of ANY existing vehicle (saving the cost of a separate/new engine). a 4x4 off-road vehicle -- in need of repairs when operating far from assistance-- at a remote desert, mountain, or jungle site! You no longer need a huge engine driven welding machine taking up most of the space in a pickup truck bed (and most of the payload as well) to do commercial welding. ZENA's new technology replaces these out dated behemoths with an underhood generator package so small, and so light, that there is: NO practical reduction in vehicle payload -- and NO loss of cargo space! Though, you will notice a huge reduction in your welding equipment cost! ZENA DC welders can be retrofitted to existing freestanding motors of all kinds including electric motors, hydraulic motors -- even pneumatic motors. does this without ANY reduction in vehicle payload! make yourself a riding welder! Installation is simple -- designed for do-it-yourselfers. ALL Parts are modular, wires are color coded, and everything plugs together easily. We even have factory made bolt in bracket kits for most of the American trucks made during the last 20 years! Best of all, when you're done, you'll have a brand new commercial duty ZENA welder -- for far less than a worn out used portable welder! That's right, LESS than the cost of a piece-of-junk welder selling at auction!And, from one-half to one-fifth the cost of a comparable new engine driven welder! Don't want to build your own? Factory installed ZENA welders are available! Our ZENA® hydraulic drive welders are perfect for use on service trucks and lift trucks with hydraulic power and absolutely perfect for use on drilling rigs, and man lifts -- including scissor lifts, boom lifts, basket lifts, cranes, etc. Forget about having to equip your truck, lift, or drilling rig with expensive, space wasting, heavy engine driven welders, long cables, loss of lift capacity -- or needing a helper just to adjust power and move the welder around the lift's work area. Specifically designed for the rigors of rental and long term construction site duty -- in all weather conditions. In addition to incredible ZENA welder performance, ZENA's unique hydraulically driven welders offer the ultimate in reliability, ease of retrofit and serviceability. In fact these hydraulic drive welding units require no routine maintenance of any kind! Best of all, you don't have to purchase a new lift to get an onboard welder! Your existing equipment can be easily converted in your service shop by your own maintenance personnel! We have a number of dealers and/or distributors, in the US and Europe who built high quality turnkey, ready-to-go, light weight gas and diesel engine driven multi-process ZENA welders -- even combination service truck workstations providing high amp DC welding current for stick, MIG, and TIG welding; AC power for tools; high current DC battery charging/boosting power; and compressed air!Call us for more information on these resources -- and check our LINKS page for details on some of these providers (not a complete list). ZENA's patented welding power generation and control technology is a sea change -- a true "disruptive technology" in an industry heretofore dominated by a few big firms who have maintained engine driven welder technology with little, or no, real innovative improvement for more than 50 years. For example, in addition to being relatively inexpensive to manufacture (with NO need to sacrifice quality to make them affordable), ZENA's welders are incredibly compact when compared to previous technology. Yet they are able to produce far more welding power than old fashioned, engine driven welders more than 5 to 20 times their weight! Better still, these tiny powerhouses produce remarkably little waste heat and ALL electronic components are MODULAR and COMPLETELY WATERPROOF -- sealed in a high tech plastic. And, since heat and moisture are the main enemy of all electronic products, less heat and/or moisture = longer service life (and fewer problems)! Put another way, these tiny ZENA welders will work productively, and more reliably, for much, much longer than old technology engine driven welders. This is not just rhetoric Check out our warranty -- 3 full years -- as long, or longer, than that provided for ANY welders made anywhere in the world. When have your ever seen a welder sold with a 60 day satisfaction guarantee? And, thanks to built-in troubleshooting features and modular components, there is no need to ever take a user serviceable ZENA welder in to a service facility -- and pay a huge fee just to see if there was anything wrong in the first place. Just follow a simple troubleshooting procedure, observe the action of a few lights, make a simple resistance or voltage reading and you're done. Equally unique, ZENA's patented electronic controls add a host of features and capabilities that set the ZENA welders far apart from today's host of existing technology based engine driven welders. unprecedented user control of the welding process. Our unique modular power generating technology and electronic controls let you mount multiple independently controlled 150, 200, 250 Amp 100% duty cycle welders to a single engine --- or combine and synchronize multiple welding power generators to create a single giant power generator producing 800 amps (or more) of welding power. as an electrically isolated, fully regulated high amp quick charger! Perfect for service trucks and farm vehicles. That's not all! Our patented cutting-edge technology puts ALL welding controls at your fingertips -- they're built into the electrode holder! You can even adjust power while welding! Giving you total and instantaneous control of the welding process. The ZENA welding system features unique (patents pending) welding power generating technology that allows you to make x-ray quality welds, and an electronic control system with a user interface unlike that of any other welder in the world. So good that it will spoil you! Our controls make welding easier for the novice and yet offer the experienced user unparalleled control of the welding process (particularly when working out of position). These unique controls also incorporate significant safety features which are particularly important when operating in difficult environmental conditions. However, all the technology in the world means nothing if it doesn't work. Our welders work -- really work! In conditions where conventional welders can't. There's simply nothing like them! Ready for 100% duty-cycle commercial use and built to last, the ZENA mobile welding system comes with a three (3) year limited warranty which does not exclude commercial use! This is the last welder that you will ever have to buy! Our half-price flat-rate rebuilding policy further protects your investment. It's simple, we will completely rebuild (or replace) any welder or welder component that we manufacture (including the power generator), anytime, for one-half the cost of a new unit! Even if your pet elephant steps on it -- you're protected! Built to meet or exceed military and underground mining equipment specifications with sealed / waterproof electronic controls, no other welder better meets the unique maintenance requirements of marine, agricultural, and industrial users as well as others who need access to superior, high-power welding equipment that can be used for repair work anywhere. Thanks to our cutting-edge technology, all ZENA welders, from our popular 150 amp model to our monster 800+ amp systems, are ultra-compact, producing more power, with less waste heat, for a given generator size, without sacrificing reliability, or performance, in any way. Compact sizing also makes installation/conversion relatively easy. Various stock welder models/configurations are available including self contained PTO drive welders, compressed air/pneumatic welders, and hydraulic drive welders. The ZENA welding power generators can be used as high current alternators/high amp alternators. 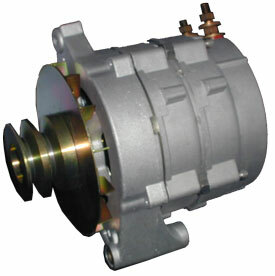 These high output alternators are used to supply supplemental or primary power for emergency vehicles and/or other special-duty vehicles which require more electrical power than can normally be generated by standard automotive electrical systems. ZENA's welding power generators can also be ideal replacements for marine alternators -- allowing boat owners to charge batteries quickly and with minimum fuel use -- when not functioning as a built-in marine welder. 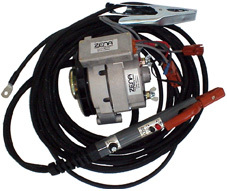 The ZENA system can be used in a non-vehicle configuration, driven by a small (11 HP or greater) engine, OR can be used to economically and easily repair or rebuild a "dead" conventional engine driven welder. It is even possible to install more than one ZENA welder on a single engine, thereby allowing multiple operators to weld simultaneously -- without limiting the ability of each operator to independently control the welding process. By combining higher power (300 amp to 600 amp) models with a compressed air source, proper controls, and a gouging torch, ultra rough-duty metal gouging and/or cutting can be supported. A number of convenience and utility accessories are available which further enhance the utility of the ZENA mobile welding system. Kits for automatically controlling drive engine speed. Kits for easily attaching a power take off point to your vehicle's existing alternator -- making welder installation even easier. Turnkey spool gun kits to support a wide range of mobile wire feed welding applications. ZENA is a trademark owned by ZENA, Inc. for its welding systems and related products. © Copyright 1998, 1999, 2000, 2001, 2002, 2003, 2004, 2005, 2009 by ZENA, Incorporated. All rights reserved. NOTE: Similar engine driven welders are made by Miller, Lincoln, Hobart, Century, ESAB, HTP, Mitsubishi, Thermal Arc, and other companies. When comparing specifications, you will find that our 150A unit is comparable to, and will do the same job as, for example, a Miller 225 Bobcat welder, a Hobart 250A welder, a Century 200A welder, or a Lincoln Ranger 8 welder. Of course, 160A, 175A, 180A, 275A, or even 300A, or 400A welders would be also in the same category. MIG and TIG torches made by companies like Miller, Lincoln, HTP, Hobart, Tweco, Ready Welder, and Forney are also compatible with our welders -- when used with the proper adapter. NOTE 2: Do not confuse our patented welding systems with other underhood welders such as those made by Premiere Power, Mobi-Weld, Stellarc, Ready Welder, and others -- our welders are built from the ground up to weld and feature specifications which conform perfectly to international standards for arc welders -- make a careful comparison. CLICK HERE TO DO YOUR OWN COMPARISON. NOTE 3: In addition to service trucks (particularly popular are Ford Diesels, Chevrolet Diesels, and Dodge Diesels) and all types of 4x4's (including Jeep, International, and Toyota), this welder can also be installed on all types of heavy equipment, including backhoes, skid loaders, front end loaders, track loaders, forklifts, and tractors as well as all types of utility vehicle.